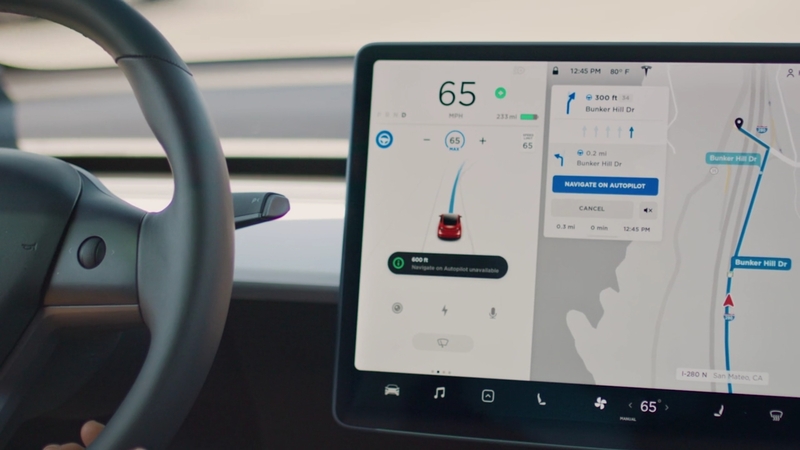 Navigate on Autopilot was initially released to members of Tesla’s advanced early access program, who received the first iteration of Software Version 9 in September. The feature, which enabled the company’s electric cars to intelligently suggest lane changes and conduct highway on-ramp and off-ramp maneuvers, was ultimately held back with V9’s initial wide release, with Elon Musk stating that Tesla needed to perform a few more weeks of validation for the function. Navigate on Autopilot eventually saw a wide release with update 2018.42, though it required drivers to use the electric car’s turn stalk to confirm suggested lane changes. In a blog post announcing Navigate on Autopilot, though, Tesla pointed out that the eventually, vehicles would allow customers to waive “confirmation requirements” like turn signals when initiating maneuvers like overtaking. “While initially, the feature will require drivers to confirm lane changes using the turn stalk before the car moves into an adjacent lane, future versions of Navigate on Autopilot will allow customers to waive the confirmation requirement if they choose to. In both of these scenarios, until truly driverless cars are validated and approved by regulators, drivers are responsible for and must remain in control of their car at all times,” Tesla noted. The release of Navigate on Autopilot would most likely be a welcome update for the Tesla community in Canada. While the feature is still tempered down, after all, it does provide Model S, X, and 3 owners with a set of new driver-assist features that would certainly make the Tesla experience more convenient. With Canada now being saturated with the Model 3, the number of owners who stand to benefit from Navigate on Autopilot’s possible rollout next week would likely be substantial. The impending release of Navigate on Autopilot in Canada is only part of the recent good news for the Tesla community in the country. Just recently, Trevor of the Model 3 Owners Club shared an email that Tesla sent out to reservation holders who canceled their orders due to the Ontario Government’s decision to end the Electric Vehicle Incentive Program (EHVIP), which amounted to CAD 14,000, last July. Tesla filed suit against the government, and recently, an Ontario Court decided that the government’s actions were indeed illegal. With its legal win, Tesla is now encouraging former Model 3 reservation holders to order the electric sedan, with the assurance that they can claim the EHVIP rebate. Following is an excerpt from Tesla’s recently sent email. Our records show that you canceled your order for a Long-Range, Rear Wheel Drive (LR-RWD) Model 3 after the Ontario Government ended the Electric Vehicle Incentive Program (EHVIP) on July 11. We’re happy to share that, after taking legal action on behalf of our customers, Tesla has reached an agreement with the Government to allow you to reorder an LR-RWD Model 3, and claim the EHVIP rebate(CAD 14,000) if you place your order and take delivery promptly. – Please order a Mid-Range-RWD Model 3 (as LR-RWD is no longer available in the configurator) using the same name and email address that you used for your original order. Your order will be fulfilled with an LR-RWD vehicle. – Once you have ordered, you must reply to this email confirming you intend to claim the rebate and providing the reservation number (RN) of your new order. – Orders will be fulfilled from our limited inventory of new LR-RWD Model 3, on a first-come, first served basis. If your preferred configuration is not available, we will work with you to find another qualifying LR-RWD Model 3. For the best chance of taking delivery by the deadline, customers should reorder as soon as possible, a no later than November 30. We will make every effort to deliver eligible cars by the deadline and strongly suggest that you schedule your delivery as early as possible in case of unexpected delays.